Move over Danica. Here comes Simona. While 21-year-old Simona De Silvestro is no glamour queen and isn’t likely to pose for the Sports Illustrated swimsuit issue or FHM, she may be just the gal to show IZOD IndyCar Series veteran Danica Patrick the way on track. Don’t get me wrong. The young lady from Switzerland is more than presentable, but it’s likely her driving, not her face or body, that are going to make her fortune in auto racing. De Silvestro will race the entire 17-race IndyCar Series, beginning with the season-opening event on March 14 in Brazil, for Team Stargate Worlds/HVM Racing. The deal that had been in the making for some time, finally came together earlier this week. She joins Patrick and part-time racers Sarah Fisher, Milka Duno and fellow rookie Ana Beatriz on the distaff side of the IndyCar Series. But it appears De Silvestro is the newcomer with the most potential and the person she will be most closely compared with is Patrick, the fifth place finisher in last season’s standings and certainly one of IndyCar’s biggest stars –maybe it’s biggest. Patrick caused near pandemonium – affectionately known as Danicamania – the past few weeks as she began an apprenticeship in NASCAR which may eventually lead to a Sprint Cup ride. But, for the next few months, she plans to concentrate on adding to her one race win (in Japan in 2008) and hopes to vie for a series championship. Both Patrick and De Silvestro drove single seater cars in Europe and came to IndyCar through the second-tier Atlantic Series. 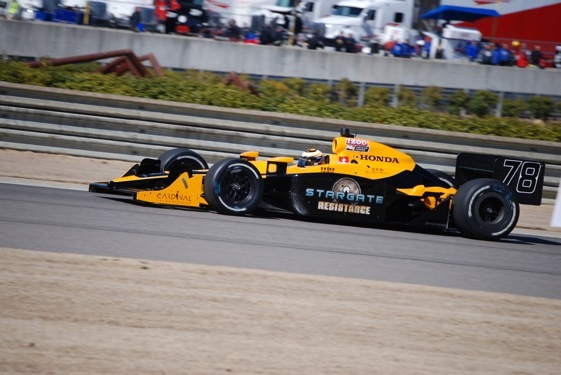 But it was something of a surprise when team owner Bobby Rahal gave Patrick, who had not won an Atlantic race, her first full-time ride in the bigger, more powerful IndyCars in 2005. The emergence of De Silvestro is no surprise at all. She came within a crash in the season-finale of winning last year’s Atlantic championship after winning four poles and four races and leading the most laps – all records for a woman driver. In all, she has five Atlantic wins and has established herself as a solid driver, though against a field not considered as deep as the one Patrick raced in that series. A recurring theme in IndyCar is that a successful Patrick, becoming a regular winner and challenging for season titles, could make a dramatic difference for the struggling series. Think what could happen if Patrick and De Silvestro BOTH find success AND develop a rivalry. Interesting thought – and not out out of the realm of possibility. Of course, Patrick has to develop the killer instinct that has kept her from becoming a regular winner, and rookie De Silvestro must prove she can be competitive in a series dominated by three big teams – Target Ganassi Racing, Penske Racing and Andretti Autosports. Some people, including this correspondent, believe that Patrick’s NASCAR experience – even though the stock cars are about as different from IndyCars as they can be – could help her find the aggressiveness that she needs to become a genuine threat in open-wheel racing. As for De Silvestro, there is little question she has talent. But other women – notably Katherine Legge, who won races in Atlantics and got a shot at the Champ Car World Series – have had the look of potential stars and not lived up to the billing. Even Patrick, with all her ability and marketability, has been something of a disappointment on track. The one thing she can point to, though, is improvement each year. She finished seventh in the points in 2007 and sixth in 2008, before moving up one more notch last year. And she is still young enough, about to turn 28 on March 25. But Patrick has yet to show she can race up front consistently. She recently signed a three-year extension of her contract with the Andretti team and insists her main goals remain winning the Indianapolis 500 – a race in which she has led and finished third and fourth – and the IndyCar Series championship. This could be a make or break year for the queen of open-wheel racing, and some of her biggest competition could come from De Silvestro. But the new girl, who has tested briefly with her new team, is trying to keep things in perspective. It may be too much to ask De Silvestro to share the spotlight with Patrick in 2010, but the possibilities are intriguing.